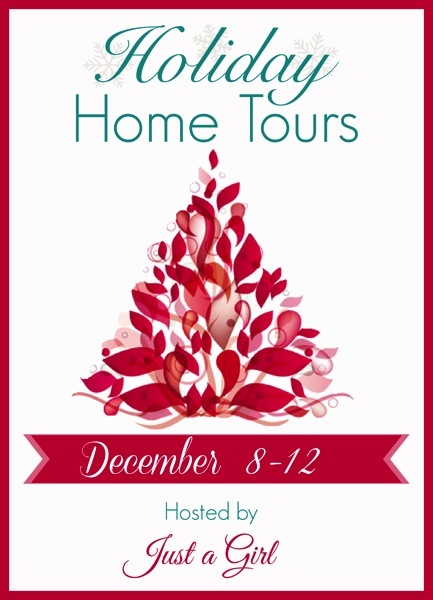 Hello and welcome to Holiday Home Tours, hosted by Chris at Just a Girl. If you are stopping by from Erin & Tricia's blog -- welcome! There are many more homes to tour -- click here to see them all. Let's get to it! Welcome to our home -- we just moved in last May and are excited for our first Christmas in our home. When I was little, I always thought I would have my home drenched in Christmas towels and soap dispensers and red and white flannel sheets in every room and trees everywhere, and now I realize that makes me tired. These are areas we decorate -- the kids all have a tiny tree in their room that they decorate, and they love that. You have a BEAUTIFUL home. It is by far my favorite, and I have looked at a lot in the past few weeks. It's festive without being cluttered, family friendly, and classy. Great job, you are my favorite blog! Stunning! That view outside your windows would have me mesmerized. Thanks, Stacey! It is beautiful here, I'm ready for snow though! We have been in the 50's and 60's nearly the whole month. Crazy. Your home is breathtaking! I just love the setting and the work you did on the outside. And those large picture windows with the tree... dreamy! Your home is simply gorgeous. Everything is tasteful and classic. You've done a wonderful job. I'm wondering if you would mind sharing where your foyer light is from? I think I remember you linking it in a past post, but I'm not able to find it. Thanks so much and happy holidays to you and your family! Did you make or buy the topiary (sorta) trees on either side of your tv? If purchased, do you mind sharing where? Beautiful home! Melissa, it looks sooo good! Seriously, you did an amazing job and I cannot WAIT to see it , and YOU in person. Love the "I Heard the Bells" sign on your porch, the greenery against the white in your kitchen and vignette, your beautiful tree against your windows, the little village in your built-ins, your pillows, your wreaths (you know I love your outdoor one) basically I love everything. 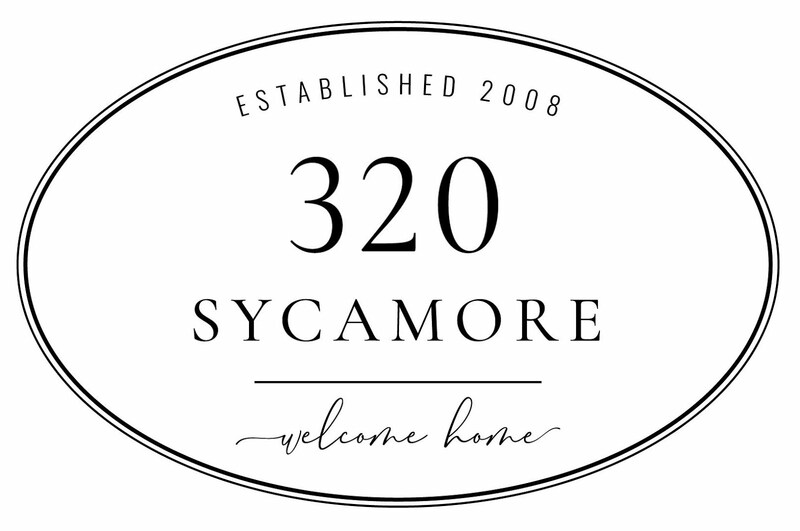 Way to go 320 Sycamore! Love you! Your house is gorgeous! Did you make your bell wreaths or buy them? Your home is beautiful Melissa! Merry Christmas to you!! So beautiful and cozy and homey! I love all the nativities and reminders of Christ, through words, lights and greenery. Enjoy your first Christmas in your new home! What a beautiful home you have! And the holiday decorations are just the perfect finishing touches on top! Oh wow. Stunning! I love your blog more and more with each post. And this new home just leaves us speechless. Thanks for sharing your talent and your space with us. Your home is lovely. Thanks for sharing! Your home is decorated beautifully! You have photographed it so nicely too. I really like the" It's a Wonderful Life" sign above the stove. Any chance you could share where you located that? Hello Kathy-- I got it years ago (maybe 7 or so) on ebay from a seller that made hand-painted signs, I'm sure you could find something similar on Etsy. Both! I'll be sharing them next week. 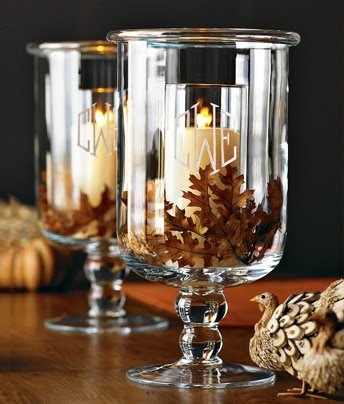 :) The one I purchased is from TJMaxx. Melissa, your home is stunning! I love all the wreaths and greenery. Speaking of greenery, that clock in the kitchen...obsessed!